The Best Fitness BFUB1 is an upright bike designed for home use. Although it’s pretty similar in construction to the FitLeader UF1, it has a lower weight capacity. However, it does offer a more advanced console. Differently put, it’s not a basic exercise bike such as the Marcy ME708. Like most upright bikes, the Body-Solid Best Fitness BFUB1 model features a frame made of steel tubing. Most of the steel parts are powder coated with corrosion resistant, gray paint, except for the seat post which has a chrome finish. The drive system enclosure however, is made of heavy-duty plastic material. This upright bike features a rather small footprint, therefore it’s a great choice for a small apartment. It’s only 41″ (104 cm) long, and 20″ (51 cm) wide, but its bases are ovalized, and rather thick tubes, offering excellent stability. On top of that, the rear base features adjustable stabilizers, so it’s not necessary to place the bike on a mat for maximum stability. When fully assembled, this Body-Solid exercise bike is not extremely heavy. It weighs only 72 lbs (32.6 kg), and also features transport wheels attached to the front base. Thus, by leaning it forward on its wheels, its relocation is easy, as you will be handling less than half its weight. The seat supplied with this exercise bike is a pretty generic one. It doesn’t integrate air cell cushioning such as the seat in the IRONMAN X-Class 310. However, it’s much wider than the seats of most spin bikes, offering more comfort for upright workouts. 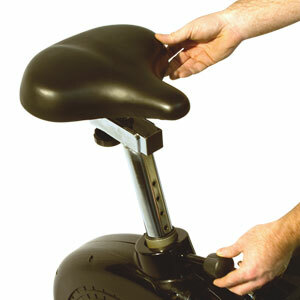 In fact, several users have reported no issues with the seat or sores, after 40 min – 1 hour workouts. The seat features a standard connection system to its post, thus it should be easy to find a replacement for it if it’s the case. The seat is adjustable horizontally and vertically, and its post is long enough to accommodate users between 5’1″ and 6’3″ (155 – 190 cm). The adjustment knobs are fairly large, with polygonal edges, so adjustment can be done easily and quickly. Also, the seat assembly is solid enough to support users up to 225 lbs (102 kg). The bike’s handlebar is fairly simple as well. It features a multi-grip design, integrating pulse sensors. It’s non-adjustable, and attaches to the vertical tube via 4 bolts. It is covered by a thin sheet of rubber foam material in order to provide a comfortable grip. 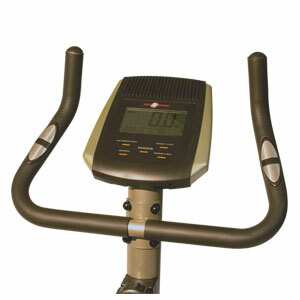 The Best Fitness BFUB1 upright bike is equipped with a manual-magnetic resistance system. In other words, its resistance system consists of a small metallic plate with magnets attached to it, connected via a steel cable to the turn-knob on the handlebar post. By turning the knob, the magnetic resistance plate changes its relation to the bike’s metallic flywheel, and thus resistance is increased or decreased. There are 8 “clicks” on the tension knob, differently put, 8 distinctive resistance levels. The resistance provided by the 6-7-8 settings is fairly decent, simulating a hill climb and offering a superior burn. Conversely, the lower settings offer little resistance, excellent for the users who require recovery training. Evidently, since the resistance system is not motor-assisted, the bike doesn’t need to be connected to a power source. Its fitness computer is battery powered. Like most exercise bikes with a magnetic resistance system, the Body-Solid BFUB1 features a belt drive system, powered by a heavy-duty, stretch-resistant rubber v-belt. Therefore, the bike supplies a smooth and quiet operation, another reason why it makes a great choice for apartment building use. Also, since it doesn’t have a chain, its drive system parts don’t require any lubrication. The flywheel equipped in this bike is not extremely heavy, weighing approx. 12 lbs (5.4 kg). However, it’s perimeter-weighted, which means that the pedaling motion is quite steady, eliminating the “stair master” effect specific to older bike models. The bike’s crank system features a set of solid steel crank arms. 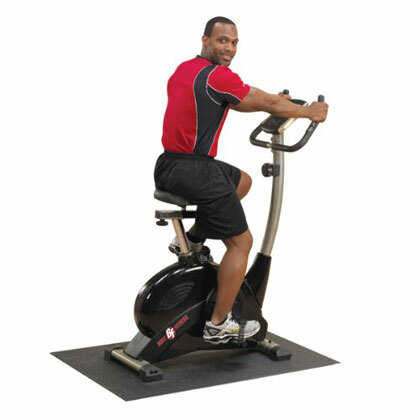 But since this is not a spin bike, it’s not meant for standing up workout routines. So, even if the bike’s crankset may hold your entire bodyweight, engaging in this type of workout routines may lead to its damage. It’s an upright bike, thus the user is supposed to pedal seated at all times. The pedals supplied are nylon-made, weighted, featuring adjustable straps. Pedaling in reverse is possible on this bike. However when pedaling in reverse the bike retains its resistance. Differently put, when pedaling in reverse you will benefit from the current resistance setting, just as if you would be pedaling normally. Also, when pedaling in reverse the fitness computer will continue to track your workout statistics. The Best Fitness BFUB1 upright bike is equipped with a fitness computer that offers quite few extra features than a basic, “SCAN” type model. First of all, it features a 5-panel display, showing time, speed, distance, calories and pulse simultaneously. It doesn’t have pre-set workout programs, but offers the possibility to set-up goals for distance, time and calories burned. It offers 8 user profiles, and can measure a user’s Body Mass Index (BMI) and Basal Metabolic Rate (BMR), as each user can input their height, weight, age and gender. It also has a Pulse Recovery function which indicates your current level of fitness, indicator that you can use to determine which is the best type of workout that you should follow. The console is not telemetry enabled. Thereby it can only read pulse if you hold onto the pulse sensors integrated in the handlebars. It cannot communicate with any HR chest strap transmitters. As we’ve mentioned above, the bike doesn’t need to be connected to a power source. Its console is battery powered, requiring 2 AA batteries which are not included. It doesn’t integrate a sound system or cooling fan like the more expensive bike models, such as the Nautilus U616 or Sole LCB. However its top part does have a small speaker for various “beep” alarms, used by several of its functions. The unit is fairly easy to operate, and the supplied manual provides clear instructions for all of its functions. If it doesn’t detect any movement on the pedals, it will enter Sleep Mode, and all the current values except Temperature and BODYFAT, will be cleared to zero. Like most upright bikes, the BFUB1 requires some assembly. But fortunately, the most problematic parts come ready-assembled. In other words, the resistance system and drive parts are already assembled, attached to the frame and enclosed by the plastic guards. All you need to do for assembly is connect the base tubes to the main frame, add the pedals, the seat and handlebar posts, then the seat and handlebars, and finally the console. This shouldn’t take more than 30-40 min. Tools and assembly manual are included. Since it’s not a chain-drive bike, the maintenance of the internal parts is not necessary, as they come pre-lubricated from the factory. Maintenance basically requires you to periodically check the bike’s joints and re-tighten the bolts if it’s the case, and wipe any water or perspiration that may fall onto the console. Console display doesn’t have backlight, so in case the room has poor lighting, it may be a bit difficult to read. The Best Fitness BFUB1 by Body-Solid, is an upright exercise bike with manual magnetic resistance. 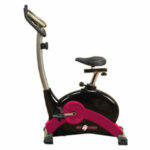 It offers a bit more than a basic upright bike, as it features a console with multiple functions and a 5-panel display. It also has a 4-way adjustable seat. In terms of fitness, it’s a great exercise bike for light to medium cardio workouts, muscle toning, stamina building and weight loss. Actually, a 30 minutes workout session spent on this bike, while using one of the top resistance settings, can help you burn up to 400 calories. It’s not a commercial grade exercise bike, but does have a solid frame. And finally, it’s not an expensive model, currently being priced for less than $300.